We got to sleep in this morning because it was a low mileage day. We only needed to do 19mi and planned to do an extra side trip with great views to fill in the day. 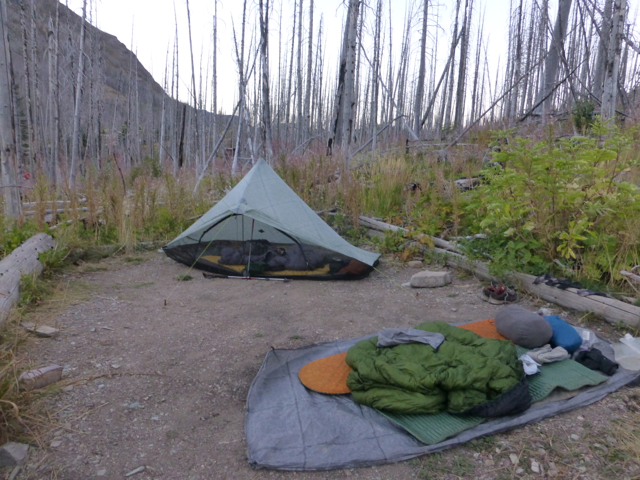 When I woke up this morning, I heard footsteps and rustling outside my tent. Bloodbath and Rampage were camped right next to me and could see behind my tent. 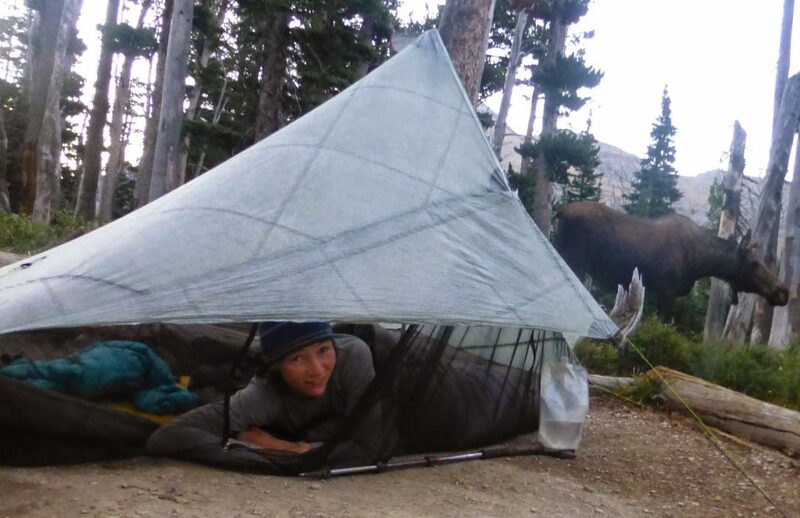 I asked Bloodbath if something was outside my tent and he said it was a big moose grazing. We even got a picture and a great video I’ll be posting. She just looked at us like she sees people all the time and kept grazing before moseying on. What a way to start the day! 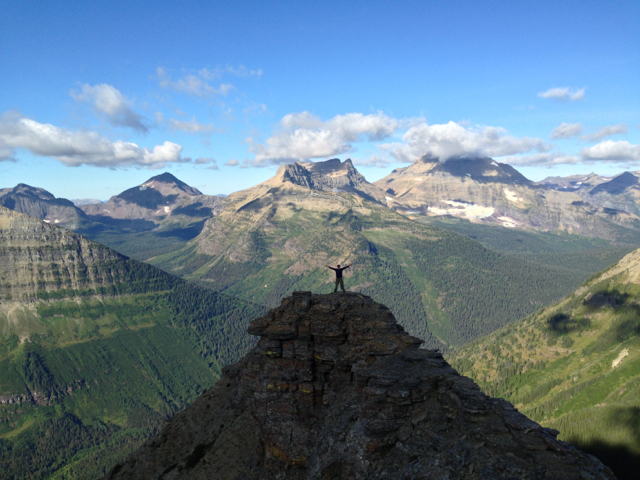 For us, Glacier is the big reward for all these months of hiking. It’s been the destination and motivation in my mind the whole time. I even pushed to end in early September so that I could have an enjoyable Glacier experience before the rain and snow starts. It’s been totally worth the effort! I knew very little about Glacier before this trip, and it’s always intimidated me. I just imagined it as an extreme backcountry area with lots of grizzlies and difficult hiking. It’s surprisingly accessible to the public and the trails are exceptional and well graded. We were rewarded today with spectacular sights! The morning started with a climb up and over Pitamakan Pass. I can only put so many pictures on a journal entry, but tons more are going on my slideshow for this section. From there, we did an extra two miles out and back on a trail that came off the CDT and went towards Dawson Pass. It was said to be an alternate with really spectacular views and it was! Personally, I think the best thing I’ve seen all trail! Wow! 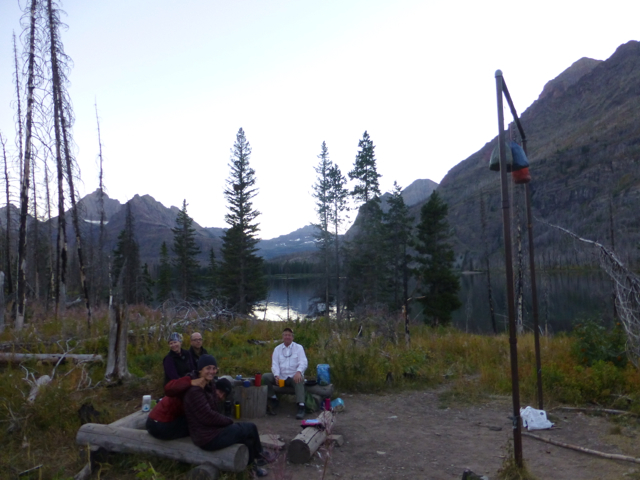 When we returned to the CDT, we hiked over Triple Divide Pass, which had a long and gradual 2,000ft climb. 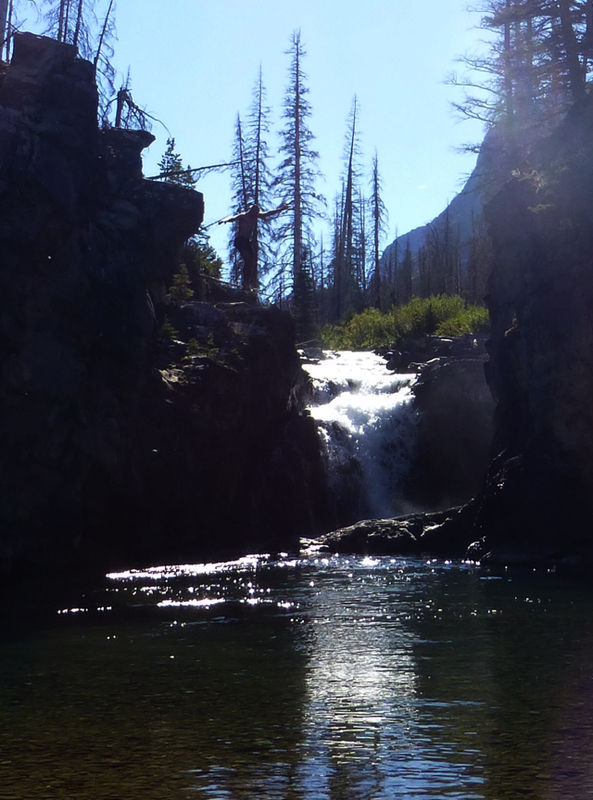 There was a great view of Medicine Grizzly Lake with a waterfall cascading down into it. The lighting is blurred in the stitch on the panorama, but you get the idea. Awesomeness! After lunch, we only had a 7mi hike to camp and we were there by 5:15pm. Definitely the earliest I’ve been to camp all trail. Along the way, we heard some people down by the creek. They were at a hidden waterfall and were jumping off a small cliff into the water. Bloodbath couldn’t resist and jumped off the cliff. Here he is jumping. He kinda blends into the trees, but he’s there. 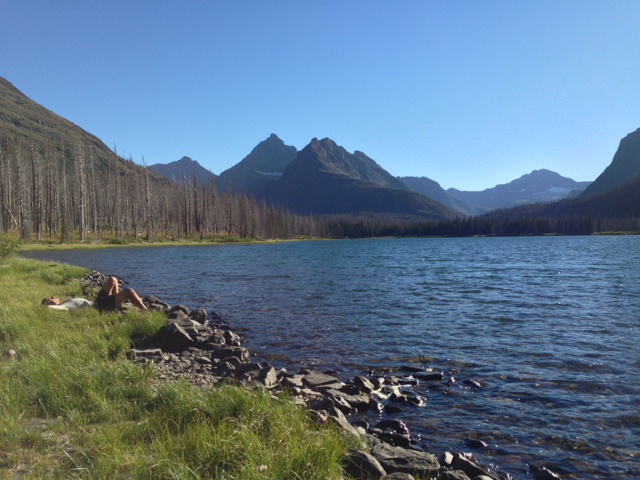 Our campsite is at Red Eagle Lake in a burn area. It’s a shame it’s a burn area, but the good news is that we can see the lake. Here is Bloodbath lying at the lake. I mentioned yesterday that the campsites are small and hardly fit two tents. They are 15×15 and here is our setup tonight. Bloodbath and Rampage are cowboyed(camping without a tent). Again, we had great company at camp and it was fun to eat with the other campers the food prep area. Good times and such a rewarding day! So damn beautiful. 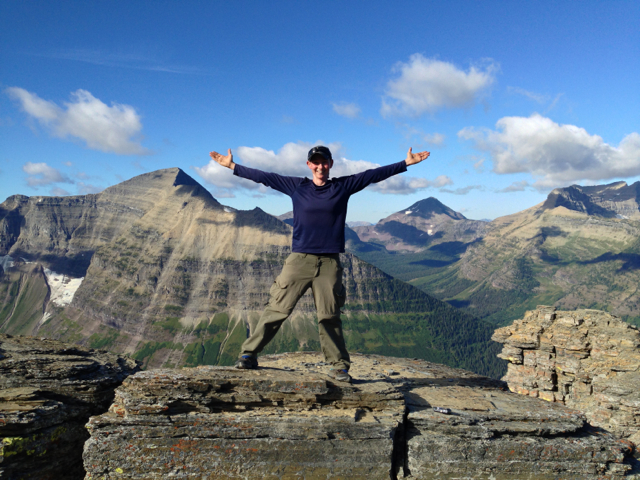 Must add Glacier NP to the must see list!